Volunteer Your Voice: Join the FSJ Editorial Board! Did You Miss an AFSA Event? There is always something going on at AFSA – we hope you have these upcoming programs on your calendar! On April 2 at noon, we invite you to join us at AFSA HQ for a town hall with the candidates for the 2019-2021 AFSA Governing Board. 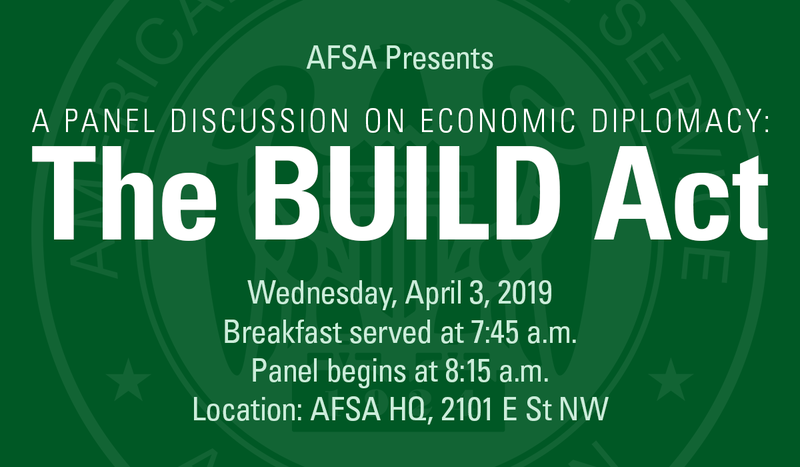 At 7:45 a.m. on April 3, we will host Congressman Ted Yoho (R-Fla.) and three experts for a panel discussion on the new BUILD Act, of which Rep. Yoho is a lead sponsor. Click here to register. On April 11 at noon, we will again will offer our very popular presentation, “Retirement Planning 5 to 10 Years Out.” This discussion is led by a former director of State’s Office of Retirement and is geared toward active-duty members. Click here for additional information and to register. Foreign Service Day programs will be offered all day on May 2, including professional headshots, an AFSA advocacy update, a panel on writing as a post-retirement career and a return of food trucks to AFSA. Stay tuned for a separate invitation to these events. Our summer happy hour will take place on June 27 at 4:30 – mark your calendars! Finally, we are happy to announce the return of baseball: The fourth annual Foreign Service Night at Nationals Park will take place on September 13. Click here for tickets! The Foreign Service Journal is now officially 100 years old! 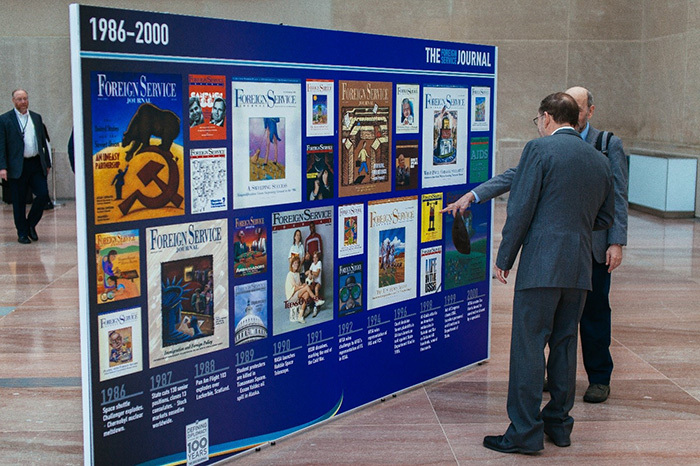 To celebrate the Journal’s historic centennial, AFSA unveiled an exhibit, “Defining Diplomacy for 100 Years,” at the U.S. Diplomacy Center on March 20. The exhibit traces diplomatic history through the lens of the practitioner, through FSJ covers through time and excerpts from a century of Journals. The exhibit will be on display at the U.S. Diplomacy Center through May 3. Drop by to have a look—and to pick up a copy of the Journal and a bookmark reminder to visit the online archive. AFSA recently completed the total digitization and optimization of all 100 years of the FSJ. This digital archive now includes a dedicated search function to help readers scan across years of Journals in search of their favorite topics and items of interest. Lose yourself in the fascinating depths of the FSJ’s online digital archive at www.afsa.org/fsj-archive. We hope you are thinking about colleagues who might make excellent recipients of this year’s AFSA awards for constructive dissent or exemplary performance. The deadline for submissions is May 24. Please visit www.afsa.org/dissent and www.afsa.org/performance for additional information and nominations forms and guidelines. 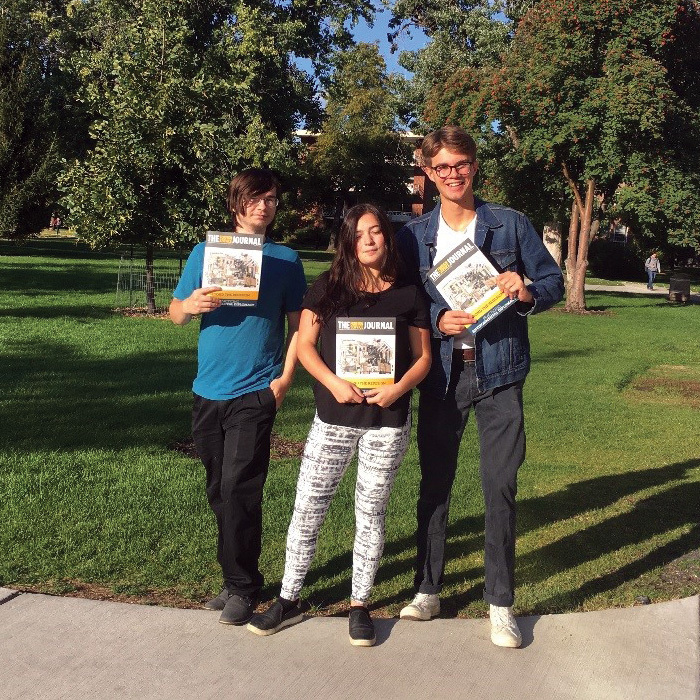 4) VOLUNTEER YOUR VOICE: JOIN THE FSJ EDITORIAL BOARD! Active-duty and retired Foreign Service members, who are also members of AFSA, are invited to apply for a two-year term with The Foreign Service Journal beginning late summer. Editorial board members, appointed by the AFSA Governing Board, meet each month to evaluate manuscripts, decide on future topics and otherwise help ensure that the Journal speaks effectively to the issues of importance to the Foreign Service. The Editorial Board sets the editorial direction of the Journal, in consultation with the editorial staff. Board members must reside in the Washington, D.C., area and be able to attend monthly meetings at AFSA headquarters (second Tuesdays). If interested, please send over your CV and a note telling us why you want to join the Editorial Board, what you would bring to the position and how you see the role of the FSJ. Please apply by April 22 to journal@afsa.org (Subject line: “Editorial Board Volunteer”). The ballots and candidate statements for the 2019-2021 AFSA Governing Board election will be sent to all members (who were in good standing as of March 28) on or about April 29. Please click here to read about how to whitelist the domain of the company that will send electronic ballots to your email. This is also an excellent opportunity to make sure we have a good email address for you so that you can vote! If you need to update that information, please let us know at member@afsa.org. We all need to be able to explain what the Foreign Service does and why diplomacy matters. One good tool to use is The Foreign Service Journal. Please think about who in your life you’d like to understand more about what it is you do and how diplomacy works—and consider signing them up for a Foreign Service Journal gift subscription. Our March issue looks at health and wellness in the Foreign Service, and we’d be happy to mail a copy out to any new subscriber. In addition to sharing understanding, your gift can help celebrate The Foreign Service Journal centennial year. To sign up, please go to the AFSA website’s subscription page. For more information, visit the FSJ, email journal@afsa.org or call us at (202) 338-4045, ext. 709. Retirees should have received their invitation to Foreign Affairs Day events at the Department of State on May 3. If you have yet to receive yours, please email foreignaffairsday@state.gov; tickets for the luncheon are available on a first-come, first-served basis. Please join The Foreign Service Journal Centennial Celebration by snapping a photo of yourself (or a friend or family member) reading the Journal wherever you are—the more distant from D.C., the better! Photos should be 1 MB or larger if possible; this is possible using almost every cell phone. Send submissions to journal@afsa.org, and please include details about yourself and the photo location and date. 9) DID YOU MISS AN AFSA EVENT? We at AFSA have been very busy on the event front in the last few months. Obviously, with most AFSA members resident outside the U.S., most are unable to attend in person. That’s why AFSA makes it a priority to record every event that takes place here at HQ and make it available to watch online. Whether it is about benefits (Social Security, Medicare, TSP), Foreign Service life (resilience, awards and scholarships ceremonies), economic diplomacy, author events – it’s all available to you at www.afsa.org/video. Dive in and catch up on an event you missed! The Foreign Service Journal welcomes your submissions on any topic of interest to members of the FS community. We are especially seeking Speaking Out submissions (1,500-1,800 words), features on topics of current concern (1,800-2,000 words) and letters to the editor responding to Journal content. Also, take a look at our editorial calendar, and consider writing for one of the upcoming focus sections, keeping in mind that lead time is generally 12 weeks. Please send all submissions to journal@afsa.org. The FSJ Editorial Board meets monthly to review and vote on which submissions to publish. Find guidance on how and what to submit on our author guidelines page. 11) PLEASE UPDATE YOUR ADDRESS! Did you receive the March issue of The Foreign Service Journal? If not, we may not have your most up-to-date address. Email us at member@afsa.org and we will correct your record.